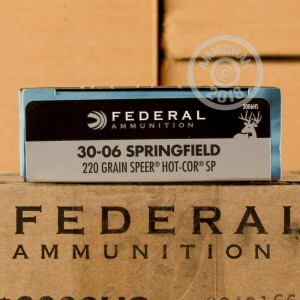 This Power-Shok ammunition from Federal is a superb deer load made even better with Speer Hot-Cor bullets. 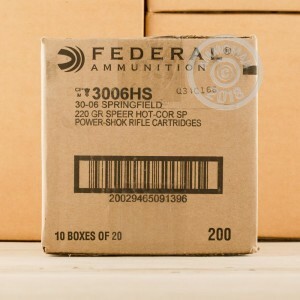 Each .30-06 Springfield cartridge in this box of 20 fires a 220 grain soft point projectile at a muzzle velocity of 2,400 feet per second. 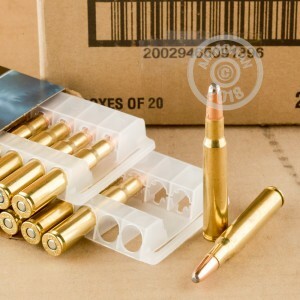 Hot-Cor bullets are an economical yet lethal choice for hunters. Each bullet is formed from a pre-shaped jacket with molten lead poured in. This results in consistent performance that won't let you down when there's a trophy in your crosshairs. Federal Power-Shok ammo is made in Anoka, Minnesota using non-corrosive Boxer primers and brass cases.